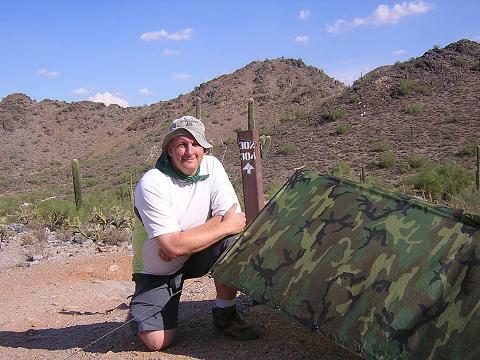 Bill Qualls - Expedient Shelter in the Desert? 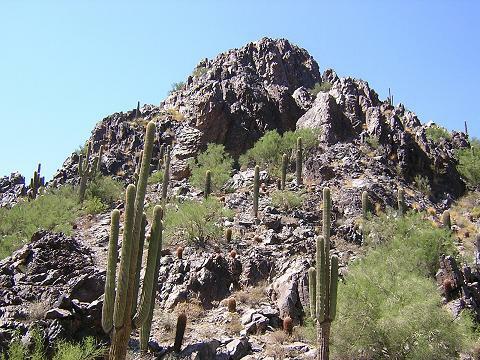 I was about 1.5 miles into my hike of the Circumference Trail which encircles Phoenix's Squaw Peak. 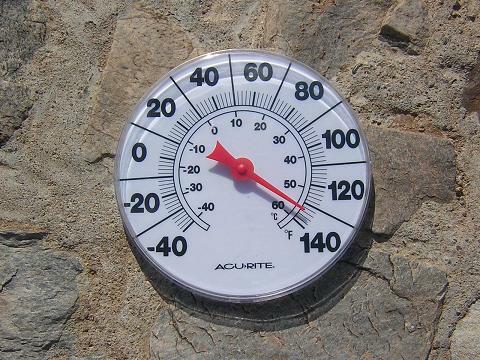 It was late July 2004 and the thermometer in the picnic shelter at the parking lot read 106 degrees when I started my hike. I had just reached a picturesque pass bordering the Dreamy Draw Park. There was a stone bench here for resting. I did not feel the need to rest, but I was ready for a drink so I removed my pack and layed it on the bench and rummaged for my water bottle (one of several I took on this hike!) 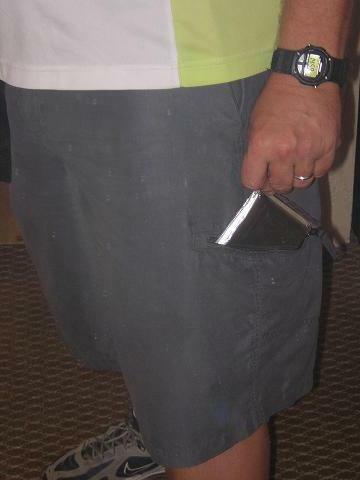 After my drink and a small handful of cheese crackers, I replaced the canteen and reshouldered my pack. As the pack came in contact with my back, I was amazed at how hot it (the pack) had gotten. I felt the rock bench which I had layed it on. The bench was uncomfortably hot. It had been soaking up heat all day long. One could hardly be expected to find rest here - not this time of year! This got me to thinking about shelter from the heat. When I think of desert shelter, I think of protection from the sun, not protection from the ground. It would appear as though I may need to alter my thinking about this subject as my short encounter with the rock bench raised the issue of the importance of shelter from the ground as well as from the sun. I was particularly concerned about field expedient shelters which could be erected with a minimum of time and effort in the event of an emergency such as heat exhaustion, a fall, etc. by me or someone I might find while hiking. I am not talking about elaborate long term living. I am talking about making myself or someone else comfortable while help can be found or until it arrives. We tend to use the term "desert" rather loosely. There are, in fact, many different desert environs. I do not profess to be an expert in deserts: I do, afterall, live in Illinois. But even within the state of Arizona, the "desert" varies widely. 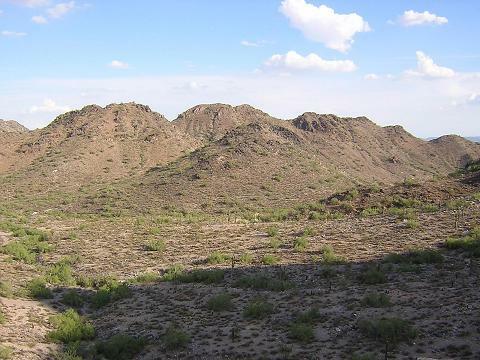 Phoenix does not have the P&J forest (pinyon and juniper forest) found just 150 miles north and at higher altitudes, such as the Prescott area. Just try hiking the Grand Canyon from its South Rim to the Colorado River and see how much difference a few thousand feet in altitude can make! I mention the differences in desert to make clear that "digging in" is not always an option. Some desert soils are just too rocky; hence the flash flood phenomenon. I didn't want to sit on that rock bench. Likewise, I wouldn't want to sit on the rocky ground in that area. It would not only be uncomfortable, it would be hot! I always carry an army surplus poncho in my backpack, and while that would provide ample protection from the sun (or would it? ), what about protection from the ground? We typically think of sleeping pads as something to carry for protection from the cold ground at night. But what about protection from the hot ground at noon? I decided to conduct an experiment about the effectiveness of field expedient shelter - above and below. I returned to the Circumference Trail a few weeks later to conduct my experiment. This time I brought a large thermometer with me. Here the thermometer is sitting on a rock bench similar to the one I mentioned earlier. It was at this point that I realized the design of my experiment was likely flawed: I don't think a thermometer in the direct sun gives an accurate reading. I wouldn't be out here if it was really 133 degrees! I went about setting up a shelter with my poncho. I wanted to measure the temperature in the shade with and without protection from the ground. 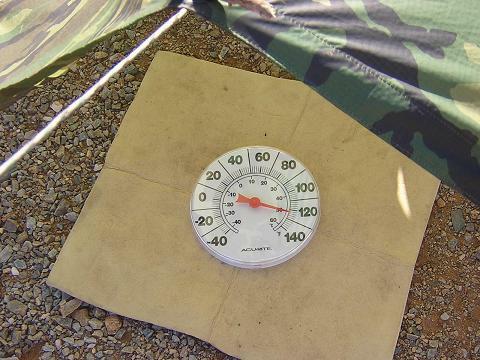 I placed the thermometer on the ground but within the shade of the shelter. I waited about ten minutes before reading the temperature. The temperature was about 124 degrees, or about a 9 degree drop. I was surprised, as I had expected an even more significant change in the temperature given the shade of the poncho. And it wasn't 124 degrees outside. But okay, maybe it's all ground heat as per my original hypothesis. So now I inserted a small piece of closed cell foam padding under the thermometer. Again, I waited about ten or fifteen minutes before checking the temperature. I was real disappointed when I found the temperature was almost unchanged! Was it the thermometer? Perhaps the foam pad was too small to make any significant difference, and the thermometer was indicating radiant heat from the surrounding ground? I don't know...as I said in the title of this article the tests were "inconclusive". About this time a couple of hikers came by. They were interested in my experiment. We spent some time talking about desert hiking and they took my picture. 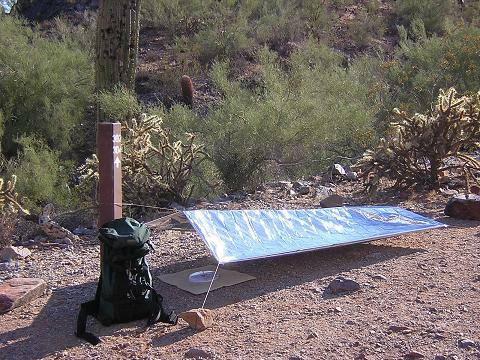 As you can see, I tied the poncho off to a trail sign and weighed all the corners down with rocks. My experiment may have been inconclusive, but I still learned something! 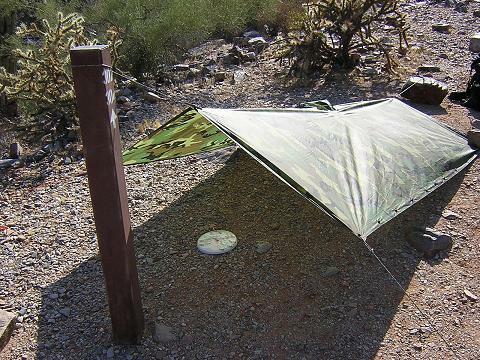 When was the last time you actually tried setting up a poncho or tarp shelter? In the desert? Try this: go into your yard or a nearby park and try setting up a poncho shelter. Allow yourself one tree only. And no tent stakes. It's hard! I quickly realized that the 20 feet of nylon cord which I routinely carry was grossly inadequate. Fine for the forests, but not here. You're going to need lots of rope to tie to logs, rocks, etc. My suggestion to you is to buy some inexpensive nylon cord and tie 8 feet to each grommet in your poncho. Coil each piece so it's out of the way when not needed (such as when you use your poncho as a poncho!) but so you that it is ready to go when you need it! 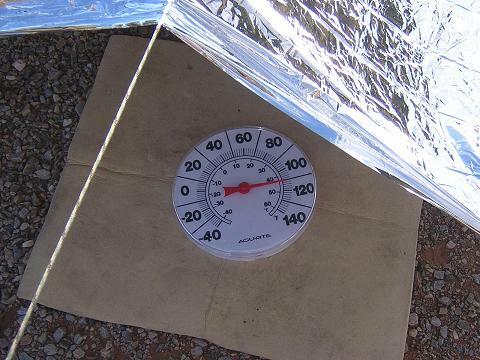 We've all heard about space blankets, those mylar foil blankets which are supposed to reflect your body heat back to you in a cold weather emergency. Well they should also reflect the sun's heat away from you in the event of a desert emergency. Or do they? I had decided to include them in my experiment. After all, they are cheap (about $2 at Wal-Mart) and easy to carry. I can slip one in the side pocket of my hiking shorts and forget it is there. But how do you set up a space blanket shelter? There are no grommets, so how do you tie a rope to it? The proper method is to use a sheet bend knot. After all, that's why it's called a sheet bend: it was used for tying ropes to sheets or sails! The sheet bend is more commonly used for tying together two ropes of different diameter. 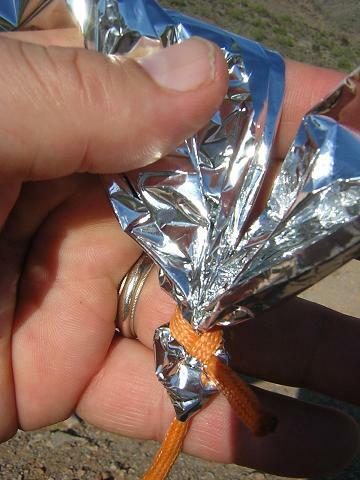 Treat the space blanket as the bigger rope. Make the "bend" in the blanket and feed the rope through as you would the smaller rope in the normal usage. I set up the space blanket shelter. It immediately occurred to me that under the best of conditions, a space blanket might provide sufficent shelter for one small person. While 52"x84" may seem sufficient when you hold it up to yourself, by the time you tie it up as a shelter it's small! While I waited for the thermometer to adjust to its new environment, it occurred to me that this shelter was probably much more visible from above than was my poncho shelter. 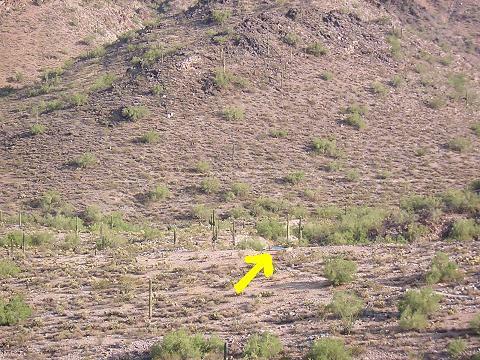 I decided to take a walk to an outcropping about 1/4 mile away to see just see how visible the shelter was. Boy, was I disappointed. From this photo you can't see anything! Here I have zoomed in to the shelter with my camera. You can barely see it. Now perhaps it would have been more visible from an airplane. Perhaps not...I don't know. But it seems to me that the success of passive signalling with a space blanket will be largely a matter of luck, highly dependent upon the relative positions of the shelter, the searcher, and the sun. Upon my return to the shelter I found that the thermometer did indeed show a lower temperature. 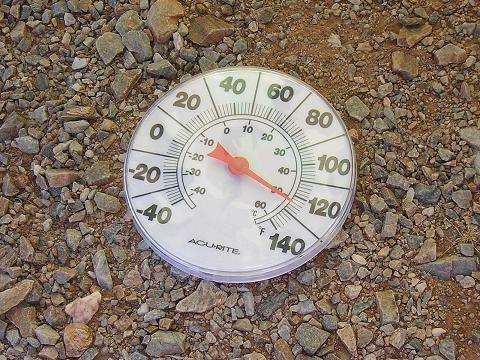 It was now 110 degrees, or a drop of about 14 degrees. So maybe space blankets are better than ponchos? It was still inconclusive to me. Was the thermometer picking up radiant heat from the ground? Afterall, it wasn't really that hot today. It then occurred to me that I had failed to test the temperature without the foam pad insulation. I removed the pad and waited for one final reading. I was disppointed to see that the temperature was unchanged. What did I learn? First, if you carry a poncho for emergency shelter, attach tie ropes to your poncho now! In this desert, trees are never conveniently located. Materials for making stakes do not exist, and you couldn't pound them in the ground if they did! You'll need more rope than you think! Second, space blankets make for small shelters, and their use for signalling is probably overrated. Would a better thermometer have made a significant difference? Would a larger foam pad make a difference, by reducing the effects of neighboring radiant heat? 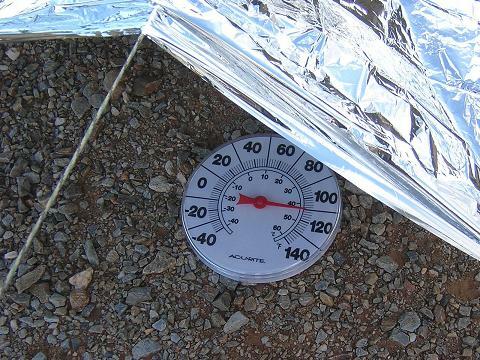 If I set up four similar shelters in the morning (poncho and space blanket, with and without foam pads) what differences would I see in temperature readings at noon? At 3pm? If anyone attempts to replicate this experiment, I'd sure like to hear from them. Copyright © 2004 by Bill Qualls. Last updated October 17, 2004.